Bird Adoption: Are You Ready To Adopt a Pet Bird? Playtime offers physical and mental benefits that help keep your dog happy and healthy. We share some useful tips for helping your dog have fun with and without you. The time your dog spends in play isn’t just about having fun. 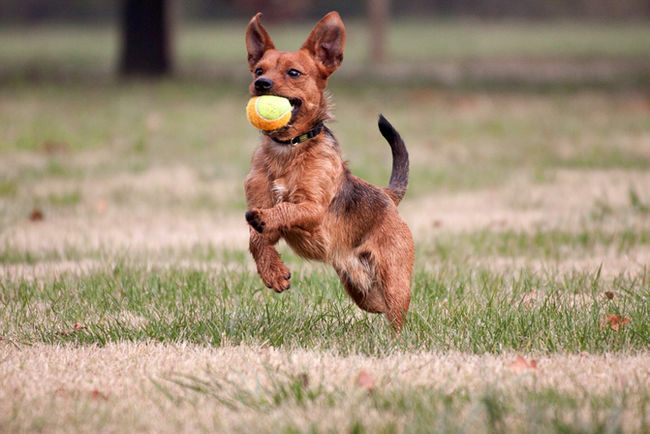 Your dog reaps lots of benefits from its playtime. 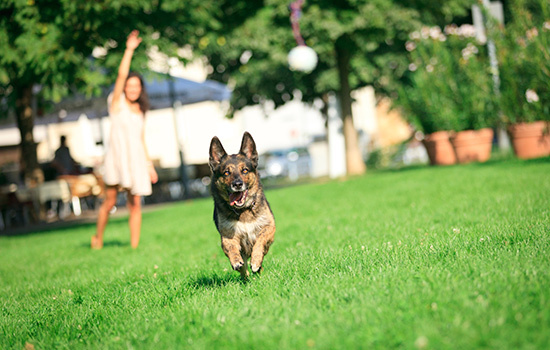 Mental stimulation, an outlet for pent-up energy, bonding with you, the physical benefits of exercise – these are just some of the advantages your dog can derive from the time it spends in play. From your dog’s perspective, of course, it’s all about the fun. But the time you spend playing with your dog can be lots of fun for you, too. And when you’re away, solo play can keep your dog entertained and happy as it whiles away the hours awaiting your return. Tug of war. Most dogs love this game, but you have to enforce some ground rules to make sure it doesn’t get out of hand. Before you play, teach your dog to release upon command. Watch your dog’s behaviour while playing. A tail-wagging growl is OK; a more serious growl isn’t. If the dog’s teeth accidentally touch your hand, stop immediately. And it’s OK to let your dog win! Hide and seek. Grab a treat – a really good treat – and hide somewhere. But don’t make it too hard; ‘hide’ someplace fairly obvious, like a chair, an open door, or a small bush. Now call your dog and wait for it to find you. When it does, praise it and give it the treat. With patience, you can also teach your dog to find hidden objects other than yourself. Chase. 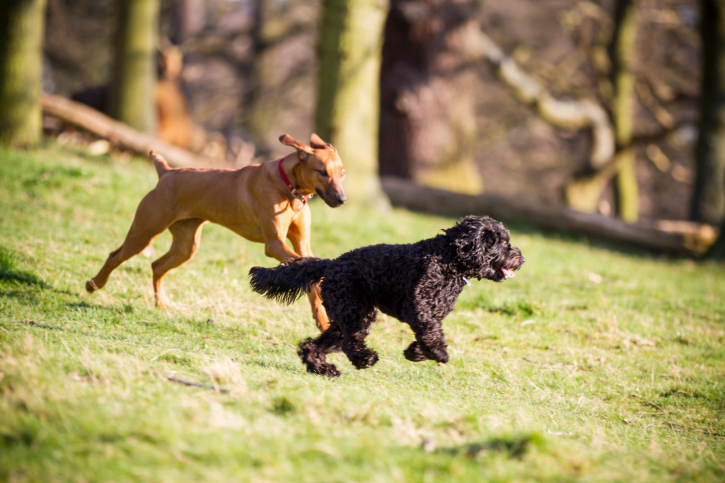 If you’re physically up for it, most dogs love to be chased and play keep-away. But your dog will likely last a lot longer at this game than you will! Keep in mind that not all dogs enjoy every form of play. They’re just like people in that respect; each dog has its individual likes and dislikes. So experiment with different games, and learn which ones your dog seems to enjoy most. If your dog doesn’t really seem to enjoy a particular playtime activity, there’s no point in continuing to play that game. Just pick another. If you’re away from home for long periods, then your dog needs to be able to entertain itself. But the majority of dog toys are not safe for unsupervised play. Some chew toys and plush toys, for example, should only be given to your dog when you’ll be around to keep an eye out for problems. Food dispensing toys: Toys that contain a tasty treat can keep your dog entertained for hours. You can buy toys that you can stuff with a treat, and that the dog will chew and lick to get to the treat. And you can buy toys that hide a treat, requiring your dog to solve a puzzle to get to the goody – sort of a doggie Rubik’s Cube. Very hard chew toys: Toys like Nylabones (nylon) or Linkables (hard rubber) are unlikely to splinter or come apart in large chunks. But don’t leave your dog alone with toys of this type UNLESS you’ve already observed your dog at play with them. If you’ve learned that your dog is a very aggressive chewer, even these hard chew toys aren’t suitable for unsupervised play. Be sure to bring out the home alone toys ONLY when your dog is home alone. Don’t have those toys available to your dog all the time. If your dog has continuous access to the toys, they will soon become commonplace and boring, and lose their effectiveness as home alone time fillers. All work and no play makes Jack… well, you know the rest. That old saying applies to people, of course. But it could just as well apply to dogs. Active and fun play is a prime component in keeping your dog from becoming a dull (or disruptive) boy (or girl). And that’s certainly not a bad thing. After all, playtime is fun – for everyone!